I was feeling a little antsy, I realized what my problem was- I hadn't crafted in over a week! Straight to the craft supplies bins I went and out came the glue gun. 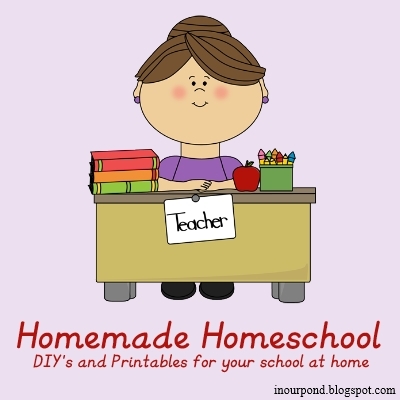 In very little time, I had whipped out these Montessori-inspired DIY's for our homeschooling. These silly things are quick and easy tongs. I hot glued two flat sticks (craft store) to a spring clothespin. I'm hoping the kids will be able to use them for transferring work. And, that they'll be easy to replace when they break. I was inspired by a pin I saw, similar to this one. One of the themes that I keep running into in Montessori education is sorting objects by whether they go on the land, the water, or the air. Many times, the kids are also given a 3-D representation of the 3 elements (like this). My version is made from very toddler-friendly plastic bottles (dollar store). 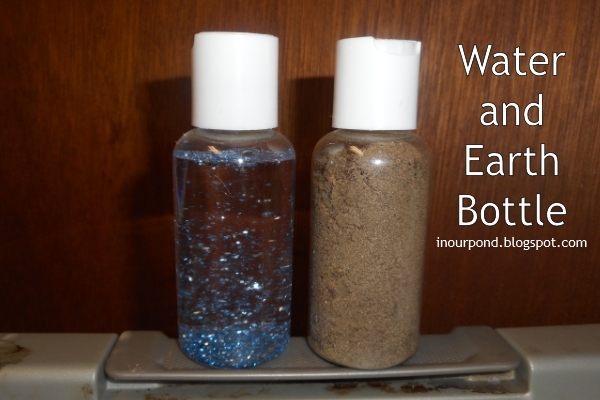 One bottle (not pictured) is empty to represent air, one is filled with dirt from our yard to show land, and one has glittery water. I know the glitter probably isn't very "Montessori" but I couldn't resist after making the dull air and dirt bottles. 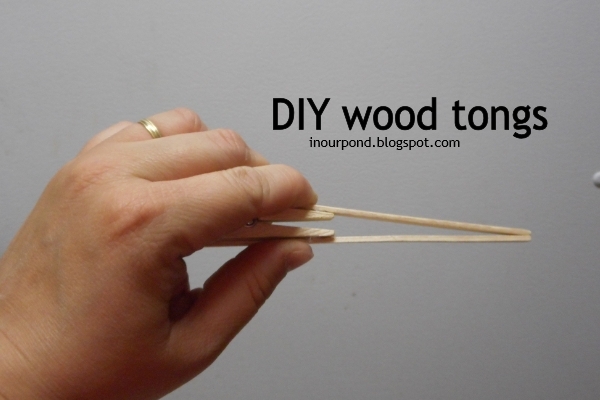 The diy tongs are great! !